702/307: Number of bachelor's degrees awarded in Arts & Sciences/Engineering. 159: Number of Arts & Sciences master's degrees in biotechnology. Number five years ago: 76. 153: Number of master's degrees awarded to full-time students in Engineering. To part-time students in Engineering: 493. 1,474: Total number of degrees awarded in the School of Professional Studies in Business and Education. Number of MBAs: 468. 236: Total number of degrees awarded at Peabody. Number of international students: 82. 427: Total number of degrees awarded at the Nitze School of Advanced International Studies. Number of PhDs: 19. 143: Total number of degrees awarded at Nursing. Awarded to men: 15. 212: Total number of degrees awarded at School of Medicine. Number of PhDs: 86. 502: Total number of degrees awarded at the Bloomberg School of Public Health. Number of international students: 125. Billed as the "one site you go to for the whole exuberant picture of life at an academic medical center," @Hopkins Medicine is East Baltimore's new online magazine that offers everything from the latest medical findings in diagnosis and treatment to opinion pieces by Psychiatry's Paul McHugh ("A Psychiatric View of Terrorism") and President William R. Brody ("The 80/20 Rule"). Belay: To secure a climber's rope and thus prevent a fall; you are "on belay" when you are roped to a climbing partner or an anchor in the rock. Dyno: Short for dynamic move, a leap for a hold that's out of reach. Jug: A big handhold or place to put your foot on the rock face. Hand jam: Wedging your hands into a crack in the rock so you can pull yourself up; can be much more painful than grabbing a jug. The Rec Center has a 5.13 route called Big Dude. Other routes have been named Multiplying Rabbits, Regrettable, and Stop Whining. Open book: Intersecting rock faces that create an angle like an open book. Flag: To extend your leg to the side, as a counterweight for balance. Stats: BM from University of Houston; MM from Eastman School of Music; MMA, DMA from Yale. Day Job: Director of the Peabody Conservatory composition department and a composer. Recent commissions include Cows of Apollo, based on the fragmentary satyr play The Searchers by Sophocles, and Lightning, with life, in four colors comes down, based on American Indian poetry. Scouting Report: Awards include the Prix de Rome, the Barlow Prize, a Guggenheim Fellowship, the Charles Ives Fellowship from the American Academy of Arts and Letters, and a Fulbright Fellowship to France. First Pivotal Musical Experience: In high school, was commissioned to write pieces for his school's band and chorus. "The thrill of hearing things played back was the beginning for me." And the Title of Opus One? First Influences: Beethoven, Ravel, Tchaikovsky. And, "My father was a pianist, and he played primarily jazz in big band-ish ensembles. I remember falling asleep to him playing down below with some of this friends." Influence of Greek Music: "I lived in Greece briefly when I was younger, and there's something very appealing about those Grecian modes, particularly the kind of keening inflection that is part of that music. The harmonies are always buzzing with life in some way." Francis Fukuyama, international political economy professor at Hopkins' Nitze School of Advanced International Studies (SAIS), recently published a new book, Our Posthuman Future: Consequences of the Biotechnology Revolution. Fukuyama's fame spins partly on his pronouncement a decade ago that history as we understood it had reached an end point with the rise of liberal democracies. That political evolution is not over, Fukuyama now notes, and he argues that new biotechnical advances, including the potential manipulation of DNA in one's offspring, could bring even greater consequences to yet unknown political orders of the future. ... Undergrads in Professor Matthew Crenson's political science course on Baltimore hit the city's streets last spring. Their goal: to investigate the struggles faced by city residents -- many of whom are African American -- who depend on public transportation to get to and from work. The group's studies culminated in a 13-minute video, "Sick Transit," which combines on-the-street reporting with research and footage of officials and activists. After debuting at Homewood this spring, the video may be used by activists who are lobbying legislators for more transportation funding. Hopkins teachers who have left their mark. "When I came to the School of Public Health I was in the process of completely changing my career path. I had previously worked for 12 years as an emergency room physician, but voluntary experiences in Bosnia had led me to consider a career in public health and humanitarian relief. Hence, I found myself moving from Australia in 1995 to pursue my master's degree at Hopkins. "At Public Health, I took five different courses from Dr. Gil Burnham, and each of them gave me greater insight into the issue of humanitarian assistance. I found Gil to be very open, accessible, and encouraging. He was eager to share his own experiences, and I frequently sought him out for advice. He introduced me to the skills that I would need in the field. In particular, he stressed the importance of developing good program management skills. To someone like me, who had always worked primarily on technical issues, this was a wake-up call. "After earning my MPH, I moved full time into disaster response and humanitarian assistance. I continue to consult Gil for advice on a variety of issues. We are currently collaborating on a project to develop a course on program management for humanitarian aid workers. My associations with Gil as a student and colleague have been extremely fruitful for me personally and I look forward to working with him further in the future." Richard Brennan (MPH '96) is director of the Health Unit of the International Rescue Committee, a humanitarian agency that provides assistance to people affected by conflict in 28 countries throughout Africa, Asia, the Balkans, and the Caucasuses. The IRC's focus is community-based primary health care and environmental health. Course: "Mummification, Pyramids, and the Egyptian Afterlife"
Course Description: The course [part of the Hopkins Summer Program 2002] is a study of the emphasis the ancient Egyptians placed upon continuing life after death. Ancient textual material, archaeological evidence, tomb design and construction, religious beliefs, and modern scientific study of the process of mummification and ancient human remains will all be combined to form a picture of one of the world's most interesting ancient cultures. Students will have the opportunity to either "excavate" or "design" an ancient Egyptian tomb to allow them to use the knowledge of Egyptian culture accumulated. The Mummy in Ancient Egypt: Equipping the Dead for Eternity, Salima Ikram and Aidan Dodson (1998). The Complete Tutankhamun: The King, The Tomb, The Royal Treasure, Nicholas Reeves (1990). Unwrapping a Mummy: The Life, Death and Embalming of Horemkenesi, John Taylor (1995). Death Comes As the End, Agatha Christie, reprint (1992). A pulse of light so quick that it could allow scientists to explore the workings of the atom's nucleus is theoretically possible based on recent advances in laser beam technology, according to Alexander Kaplan, Hopkins professor of electrical and computer engineering, and Peter Shkolnikov of the State University of New York at Stony Brook. Currently, extremely short laser bursts are fast enough to illuminate the vibration of molecules and movement of electrons, but such lasers have not yet broken the nuclear barrier. Now, however, high-powered petawatt lasers are under construction at a few scientific facilities worldwide. Through a series of calculations, Kaplan and Shkolnikov showed that in theory, a petawatt laser with circular polarization could be used to create electromagnetic pulses lasting only a zeptosecond, or one-billion-trillionth of a second, to peer inside atomic nuclei. (A rotating electrical charge would emit radiation in zeptosecond bursts). The scientists report on this theoretical process, dubbed the "lasetron," in the February 18 Physical Review Letters. Such a charge also would generate a huge magnetic field, on par with what can be found in a white dwarf star, for example -- allowing scientists to better study the nature of such astrophysical environments from within the lab. "Whenever we can work with anything that does not exist in our laboratories, that is a great thing," Kaplan says. Further down the line, the proposed lasetron could help researchers understand how protons and neutrons form a nucleus, or even illuminate nuclear fission, allowing scientists to control nuclear reactions in the cell. Such advances would still need to overcome a litany of barriers, including the fact that there's no sensor yet sophisticated enough to detect zeptosecond pulses. Mating songs are more than just amorous enticement for one of North America's most common birds, according to a new Johns Hopkins study. Deborah Duffy, formerly a Hopkins doctoral student in psychological and brain sciences and now a postdoc at Indiana University, recently published the results of a study of starlings with her mentor, Hopkins professor Greg Ball, in The Proceedings of the Royal Society of London. Female starlings favor mates who sing more often and sing longer songs, and Duffy and Ball showed that male starlings with exceptional singing abilities also tended to be starlings with the most healthy immune systems. "Choosy females benefit by mating with the males with the strongest immune systems, because presumably the offspring inherit some of that high immunocompetence," Duffy explains. Angioplasty offers heart attack patients a better prognosis than clot-busting drugs, even when performed at a smaller hospital lacking a cardiac surgery program, Hopkins researchers report in the April 17 Journal of the American Medical Association. Both treatments are used to clear arteries that impede blood flow to the heart. In angioplasty, a small tube is threaded through an artery and a balloon is inflated to widen the vessel. Clot-busting thrombolytics dissolve obstructing clots but carry the risk of causing a brain clot. The treatment a heart attack patient receives depends largely on geography. Only a minority of hospitals -- those with the capability to perform open-heart surgery in case complications arise -- have been permitted to conduct primary angioplasty. The Hopkins team acquired waivers to establish angioplasty programs at 11 community hospitals in Massachusetts and Maryland. Over the next three years, the hospitals randomly assigned qualifying heart attack patients to receive either balloon angioplasty or clot-busting drugs. A total of 451 patients participated. In the six weeks following their heart attacks, the angioplasty patients had fewer repeat heart attacks (4.1 percent vs. 9.5 percent), strokes (1.2 percent vs. 3.8 percent), and a higher survival rate. The trend was similar at the six-month point. "It's sort of amazing," says professor of medicine and lead author Thomas Aversano. "We are monitoring quality and yet we allow for there to be two distinct standards of care: a good one, thrombolytic therapy, and a better one, angioplasty." Louis Sudler knew the value of a well-rounded life: a real estate magnate who sang opera, he combined his business sense with a love of music to elevate the Chicago Symphony from parochial to world-class. To make his point that art has a place in everyone's life, Sudler established the Sudler Prize at universities better known for business and science than artistic expression. 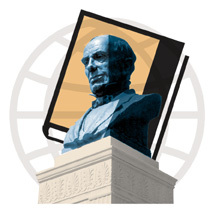 Johns Hopkins made his list, as did Yale, Harvard, MIT, and Stanford, among others. Since 1983, the Hopkins Sudler Prize has been awarded to a student or students who demonstrate excellence in music, theater, dance, writing, filmmaking, or the visual arts; only graduating seniors from the schools of Engineering or Arts and Sciences and fourth-year medical students are eligible to submit entries. This year, Jeffrey Arkles, a physics and biophysics major, and Wesley Smith, an electrical engineering and French major, shared honors for their photographs, with each winner receiving $1,500. "One thing the committee was struck by was how both photographers' work was really excellent and so totally different," said Julie Morgan, who chairs the Sudler judging committee of faculty and staff drawn from Homewood, Peabody, and Hopkins Medicine. "Jeff's pictures were almost classical, very static and quiet, whereas Wes' photos were kinetic, colorful." The seniors' attitudes toward their art would no doubt please Sudler, with his views on a balanced life. Arkles sees photography as an outlet from his work in physics: "This is what keeps me sane," he says. Smith views his engineering degree as a means to an end for his art: "Technology is so important -- you need to know how things work." Arkles became enamored of photography in his sophomore year, when he took his first class with Homewood Art Workshops instructor Phyllis Berger. The ability to manipulate the image during printing makes black and white film his favorite medium. 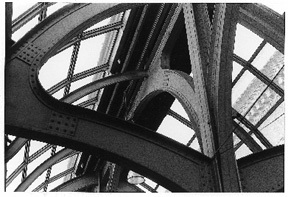 The image at right is one in a series he submitted to the Sudler committee, all taken at Philadelphia's 30th Street Station with his 20-year-old, secondhand Minolta. Arkles is drawn to architecture in his work: "I can see that something would be a good picture -- the curve of a building, the way a shadow falls." For Smith, who spent a year at the École Nationale Supérieure des Arts Décoratifs, one of the top studio arts schools in France, photography is part of a journey in the arts. This fall, he begins work toward a master's degree at the Maryland Institute College of Art. He's already put down his camera; a new work using motion sensors to create an auditory environment went up in April in a Mattin Center hallway. The work is informed by his electrical engineering studies (and doubles as senior design piece for his major). 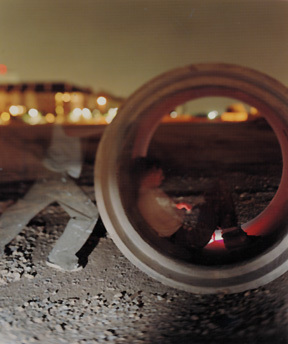 The work submitted for the Sudler Prize (at left), taken with a 4x5-inch large-format camera, reflects Smith's explorations of using the human body "as a mediator between the physical spaces where the photographs were made and the retinal image the viewer takes in when examining the final, print form of the image." For Smith, the challenge lay in devising the ideas for the images, then figuring out how to translate his ideas onto film, often by constructing tightly controlled environments. Sgt. Caroline Bennett, a Hopkins Security officer for nine years, worked her way up from a rookie with a criminal justice degree to assistant day shift commander. Known around campus as "Sarge" or "Carrie," on e-mail as "hopcop," and on radio as "Unit 1," she's part police officer, part campus guide. 6:30 a.m. Squad room roll call with Lt. Mark Carter, shift commander. The day shift shares "firehouse coffee" as Carter reads the weekend incident report. Top news: an armed robbery of students off-campus, damaged vehicles in the Homewood Garage, shoplifting involving an intoxicated student. 6:56 a.m. Grabbing a multichannel radio, Bennett heads out to check her Chevy Tracker: Dents or dings? No. Searchlights and overheads OK? Yes. Equipment (defibrillator, oxygen tank, first aid kit, fire extinguisher, jumper cables) accounted for? Yes. 7:15 a.m. After unlocking buildings, it's "glass check" for broken windows in parking lots, mail run, patrol of reserved lots to make sure construction crews aren't parking there. She gives directions to two vans and three visitors, and, with a trademark wave -- friendly yet authoritative -- allows pedestrians right-of-way. 8:38 a.m. Stops by Hodson Hall construction site. "Can't park here!" the workers joke when they see Bennett. The foreman says he'll bring on extra security at the site after recent vandalism. "Let us know who it will be so we don't arrest 'em," Bennett says. 8:46 a.m. Building checks, including Garland Hall, where every office has a bowl of candy. Bennett takes a peppermint. 9:57 a.m. High-visibility patrol off campus to Oakenshawe, where a block with students in residence has been hit hard by a burglar. Bennett spies a bedraggled man with a cart. "Hello sir," she says. "What's going on?" It becomes apparent he's the neighborhood "can man" and an unlikely suspect, so Bennett asks him to be on the lookout. "What's your name?" "Paul," he replies. "Carrie," she says, sticking her hand out for a shake. 10:18 a.m. Respond to Fire Trouble Alert in McCoy Hall; lots of noise, no smoke. "Probably a steamy shower," she says. 11:35 a.m.-12:05 p.m. Mac-n-cheese lunch in the squad room. 12:18 p.m. Report of an employee feeling faint in Levering. Bennett knows him; he refuses an "ambo" and, after a consult with volunteers from HERU (the student medic corps) she transports the man to Union Memorial. "It will be all right," she tells him. 2:53 p.m. Gas tank filled, 35 miles logged, it's back to the squad room to turn in keys for the next shift and finish her daily report.